(This post is over two months late because, well…we’ve been busy)! 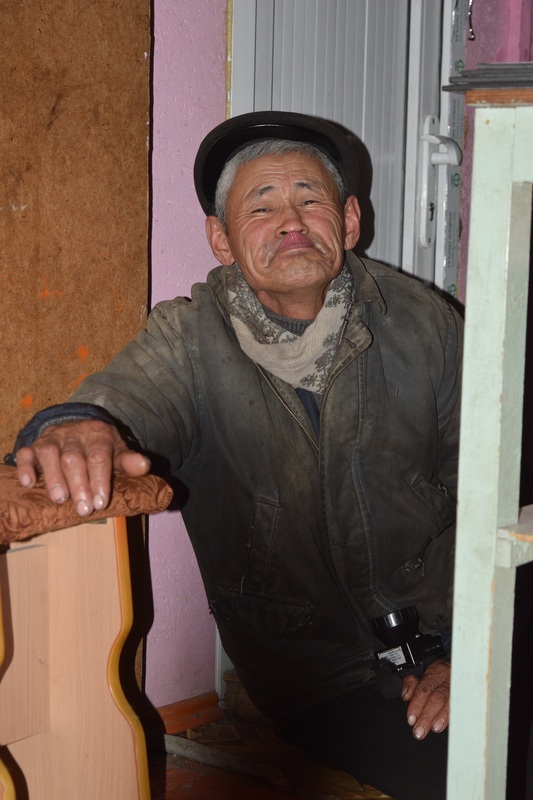 Even Joe managed to smile through his horrific vodka-induced hangover as we cleared the Uzbek border fortress to find the Kyrgyz customs officer sitting in his tiny unassuming hut on the other side. 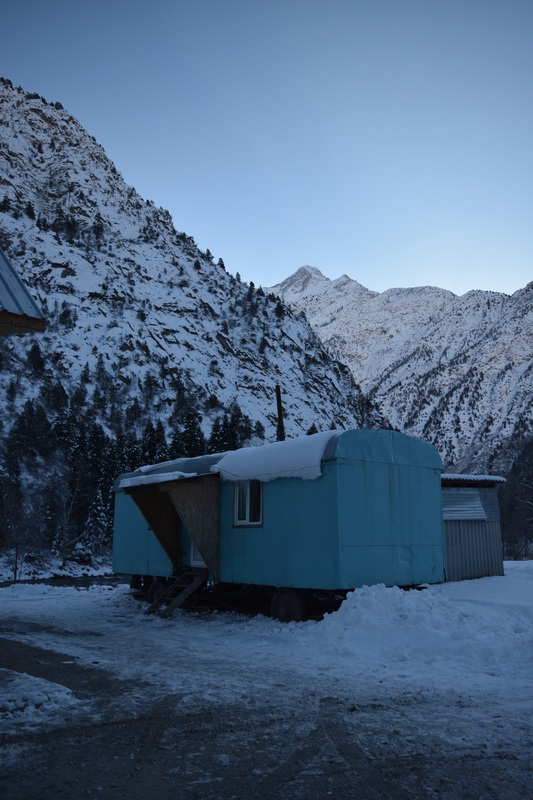 We had finally arrived in the country we’d been pushing towards for months, where we plan to sit out the harsh winter and teach English until the snow melts. This was the final leg of part one of our adventure! 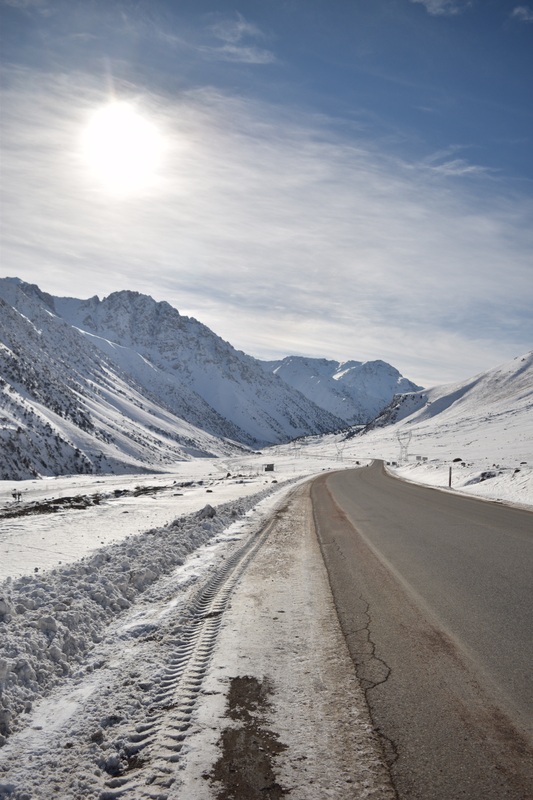 We could have taken the easy option and headed north after Tashkent, back into Kazakhstan and along the flat plains straight to Bishkek, but we had been romanticising about the mountains of Kyrgyzstan for far too long to miss them because winter had come early. We decided to take the scenic route and deal with the consequences if and when they came, knowing that if things got too difficult, we could always hitch a ride. 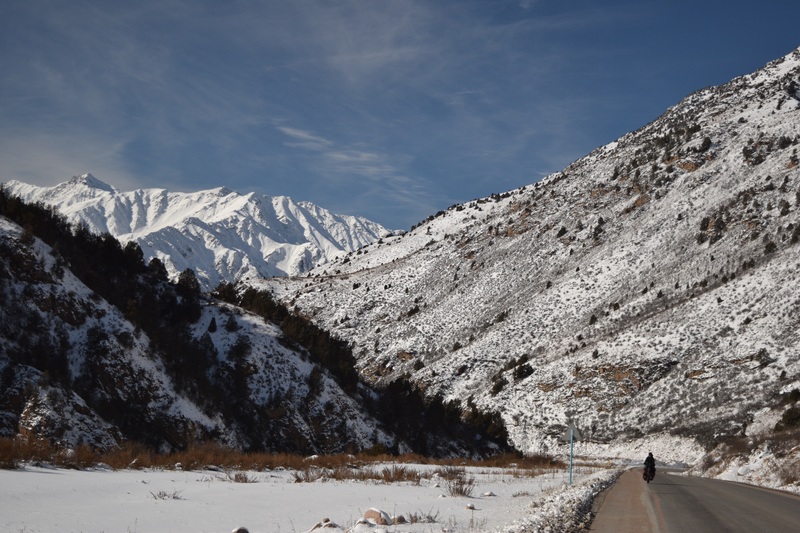 Our route through the Jalalabad region would be the most mountainous stretch of the trip so far, with our three highest passes to date towering between us and Bishkek. Thankfully (for Joe’s delicate head), the first afternoon was a relaxing introduction to the country through rolling farmland with the mountains keeping a safe distance in the backdrop. Immediately we noticed how much calmer everybody seemed here in contrast to the previous few weeks. Still friendly and saying hello, but without the constant barrage of loudly shouted questions. At least for today it was a welcome relief to get a bit of peace! We spent a really memorable first night in the home of one of the sweetest families I’ve ever encountered. We’d asked whether it would be ok to put the tent up in one of their fields as we couldn’t find any land that wasn’t farmed, and were instantly told that it was far too cold to be camping, so we must come inside and be their guests. Five minutes later we were sitting on floor mats around a table filled with hot tea, borsch, sweets and an assortment of things grown on their farm. (I decided to nobly take on the role of vodka-accepting guest as Joe had suddenly become “allergic”). They had a great sense of humour, and we spent the evening talking and laughing (and being entertained by their chubby toddler) until it was time to curl up under warm heavy blankets on the floor and sleep. Houses in this part of the country are basic but beautiful. Most have a central courtyard around which the house is divided into separate buildings. Ok there may be no bathroom in sight, just a jug from the well and a hole in the ground outside, but there’s definitely charm to be found in their richly patterned wall hangings, floor mats and curtains concealing every door. Sleeping amongst all this decoration feels almost palacial, yet so refreshingly simple at the same time. In the morning, it was difficult to turn down their tempting offer of “please stay here for ten days and relax”, but we knew we had to try to get over the mountains before it started to snow again, so after a very long breakfast we forced ourselves to pedal away. It seemed winter had temporarily forgotten about us, so we needed to sieze the opportunity! We left the village and began our first of many days of climbing. The first word that came into my head as we wound our way into the mountainy wilderness was “spiky”- I don’t think I’ve ever seen a landscape with so many jagged ridges, and our road zig- zagged amongst them all day, following the river. This is the part of cycle touring that I love most- finding yourself in a wild landscape completely unspoiled by humans, and so quiet that it feels like a secret. It’s hard to beat the feeling of putting your tent up next to a river, with mountains all around you, and watching the stars. That’s actually possible without freezing now thanks to our new found obsession with campfires. 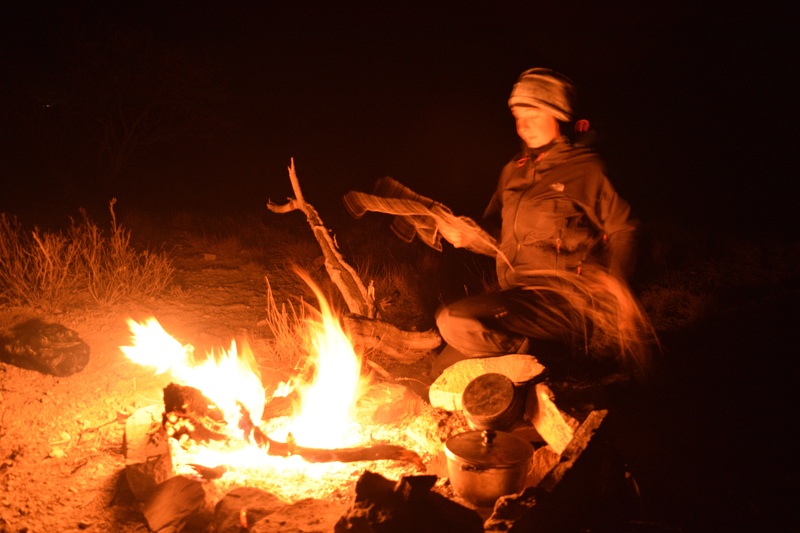 We decided to pull out all the stops for the fire that night, making toast from our stale bread, and even melting chocolate in a makeshift bain-marie for dipping. (We awarded ourselves an extra adventure point for managing to actually cook something on our fire)! When we eventually found civilisation again the next day, it was slightly ominous. On the rock face at the entrance to the town of Karaköl, some cheerful soul had scratched a greeting in huge foreboding letters, “Welcome to Hell”. We decided to take the warning lightly and imagined that whoever wrote it was probably just having a bad day. A few hours later, we weren’t so sure. By this point we were quite high up and it was going to be a very cold night, so we decided to treat ourselves to a guest house before tackling the first pass in the morning. After asking for directions, we found ourselves in front of what looked like the bleakest of grey council estate blocks ever built, surrounded by smashed windows and graffiti, thinking,’this can’t possibly be it…’. It was indeed our new home for the evening, and we had to get used to it fast as it was the only place to stay in the town and it was already getting dark. The giggling pair of teenage boys who let us in told us that our room wouldn’t be ready for an hour, so we left our stuff and went out for some food. 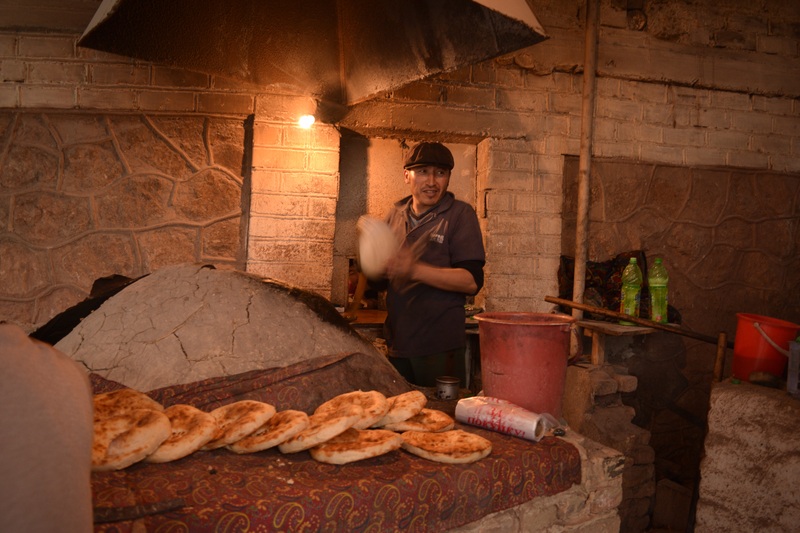 Two things were beginning to stand out about Kyrgyzstan in the days that followed: horses and fat soup. (The first being considerably more pleasant than the second). Horses seem to be to this country as bicycles are to the UK- if you’re not driving a car, you’ll be on a horse instead. Outside every village shop there would be at least three people sitting on horseback with their freshly bought groceries and all along the streets there would be men stopping to chat from their saddles. In a country whose history is based on millennia of nomadic herders, it was nice to see that the modern world hasn’t managed to erase this deeply routed tradition completely. It felt like a snapshot from centuries ago, cycling over rolling pastures and seeing people galloping around freely in the background. 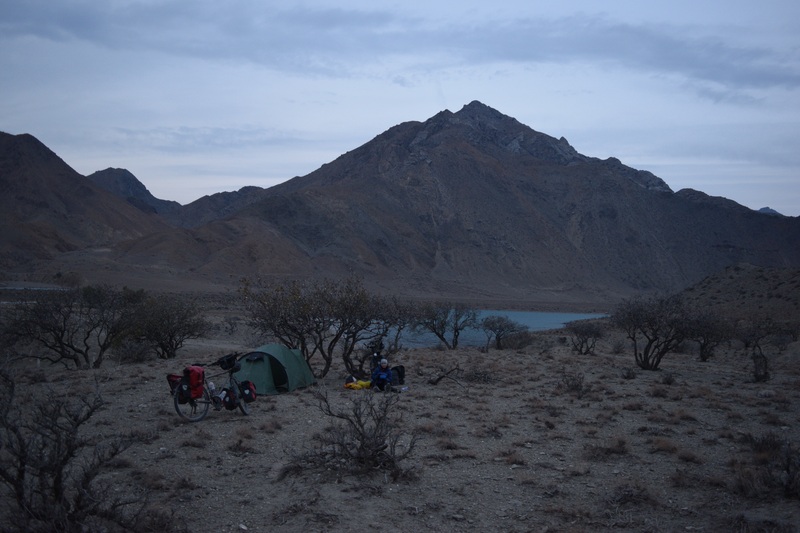 Anyway, after a few days off to gather our strength in Toktogul (I was feeling ill for some reason- I blame the fat), the time had come for us to tackle the monster pass of 3500m. 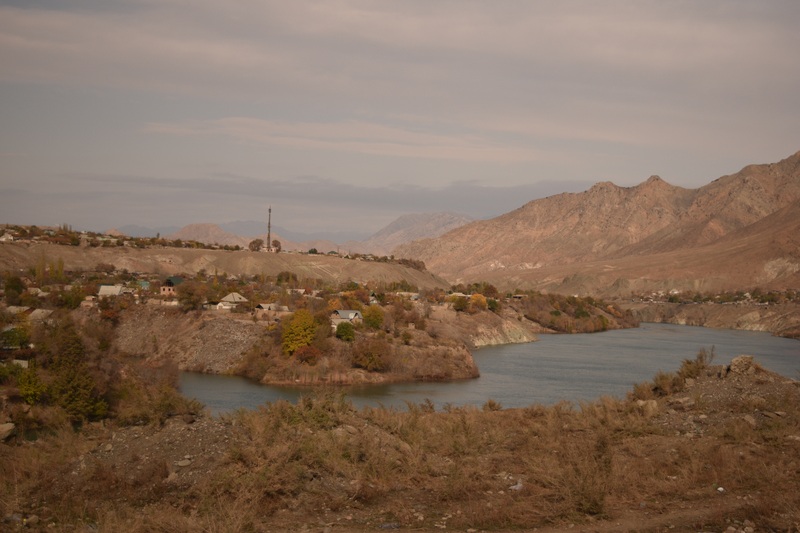 By this time, we were right at the foot of the Tien Shan mountains, and could see that snow was only about three kilometres away. This was the one that would really test us- we’d done snow cycling before, but at a much lower altitude, so we had no idea what the road would be like or how cold it would get up there. One thing we agreed upon was that we didn’t want to be camping anywhere near the top. The first day of climbing was fairytale-like, following a winding river through a narrow gorge of jagged rocks, with the icy peaks towering in all directions. The climb was gradual, and the road was good, so we were beginning to think the whole thing would be easy. With about two hours of light left, it started to snow heavily, so we decided to look out for a building that could keep us warm for the night. It was too remote a place for villages, but there were occasional chaikhanas for people travelling through the mountains. We stopped at one just as our hands were beginning to go numb and the dusk was setting in, and asked whether we could stay if we bought some food. The inquisitive group of people outside seemed to think this would be a problem, and told us that we’d have to turn back. Apparently carrying on wasn’t an option as there was “nothing that way for 100km”. Normally when people give us advise like this (which is almost every day), we take it with a pinch of salt, as every time so far has been absolutely fine. 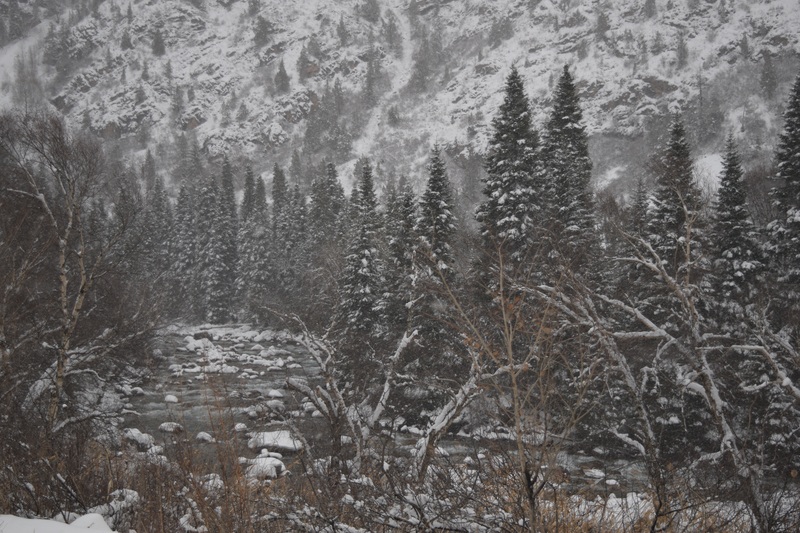 With the heavy snow though, we didn’t want to take the risk, as camping would have been extremely unpleasant in those kind of temperatures. Eventually, the owner of the cafe realised that we really didn’t have any options, and suddenly became extremely helpful. He led us around the side of the building, to a tiny caravan. Apparently, this was where the staff slept, and we were welcome to stay there to keep warm! I could have hugged him. We’d been seeing these little caravans a lot in the mountains, rather than actual houses, and were curious to go inside one. Inside we found that it was completely filled with bunkbeds, a little tv and a woodburning stove. We couldn’t believe that ten people slept in this tiny space every night. We spent the evening in the cozy warmth, chatting to our host in bad Russian (mainly answering the usual questions: “Why don’t you have children? You’re 25- you should have three children by now! Manchester United or Arsenal?” etc.) and then went to sleep in our springy bunk beds. The day of reckoning had arrived. We had to make it to the top of the pass with enough time to descend to a warmer altitude and/or find somewhere warm to stay once it got dark. Our speedometer battery was flat, so we had no idea how far we’d come or how high up we were. For all we knew it could take us a few hours or all day to get to the top. I started to get nervous the minute we stepped outside and felt the stabbing cold. Getting going is the hardest part as it takes so long to warm up your hands and feet. Ever the master of good timing, Joe discovered (to our mutual horror) that he had a puncture just as we were about to start, so he had to get the tyre off and change his inner tube without any feeling in his fingers. (I can’t even manage it on a sunny day so I thought it was pretty impressive). An ominous beginning perhaps? Because of the narrow-ness of the gorge we were following, the sun didn’t reach us for hours, so our hands and feet stayed numb pretty much all morning. We didn’t bother to have lunch as the bread we’d bought fresh that morning was frozen, as was all our water, so drinking wasn’t really an option either. Our plan was just to get to the top and over as soon as possible, then we could worry about things like eating and drinking. The higher we climbed, the more intense the cold became, until it reached a stage where we could no longer feel our faces. That was scary- that had never happened before. Eventually, even though we were both cycling in our down jackets (which is mental considering how hot they are to climb in), the cold felt like it had consumed our entire bodies. I couldn’t even tell whether I was holding on to the handlebars anymore. Surely we were near the top now? We could see the peaks all around us, everything completely covered in snow so thick it would have come up higher than the tent if we’d tried to put it up. Luckily the road had been clear, but even that changed the higher we climbed. Before long it was covered in a lethal sheet of ice and crunchy snow, and at that point, cycling became almost impossible. We had to get off and push for a while as is was faster than slipping off all the time. It reached a new level of scary when we rounded a bend and saw a recently abandoned lorry overturned on the side of the road. It must have lost control on the ice. It was the first of many. By this point, we worked out we only had an hour of daylight left and we had no idea how close we were to the top of the pass, or whether there would even be anywhere to shelter from the cold on the other side. Even if there was, how on earth were we going to descend a steep mountain pass on a road that had turned to thick ice? Putting the tent up was absolutely not an option in such deep snow, and if we were scarily cold now, how much colder would we be once the sun disapperared? I’m not over exaggerating when I say that now panic began to set in. Joe lost it first, which meant that he was the one who was allowed to panic. We seem to have a system for coping with stressful situations whereby whoever outwardly panics first is allowed the luxury of a meltdown, and the other person automatically adopts the role of the calm and rational one. Normally I beat him to it on the meltdown front, but this time I heard myself saying, “I promise you we will be warm tonight. We will sleep inside and laugh about this.” I didn’t believe it for a second. We agreed the time had come to think about hitching a ride, and as though our thoughts had been read, around the next bend we found a transit van waiting with its doors open, and two concerned-looking brothers beckoning us in. Well that was easy. I’m against taking any other form of transport unless absolutely essential, but this time definitely counted as essential. We decided to ride with them until we saw that it would be possible to cycle again, i.e. when the road was no longer a sheet of ice and we could find somewhere indoors to stay. I was the lucky one who got to ride in the front and see what we were missing; poor Joe was assigned to the back of the van in the cold and dark. It turns out we weren’t far at all from the top, but in the ice it would have taken us until dark to reach it, and on the other side, I have never seen so much snow. A huge plateau as far as the eye could see, and absolutely no signs of life. It’s pretty impossible to describe how beautiful this was just after sunset with the pink sky reflecting on the white snow, and mountain streams as bright blue as sapphires, but I didn’t regret hitching a ride one bit. Sometimes you just have to accept that nature has defeated you. (Unfotrunately, our hands were too frozen to unzip the camera case). To cut a long story short, the ice sheet on the road carried on throughout the mountain plateau and over the next pass, with overturned vehicles strewn all over the place. 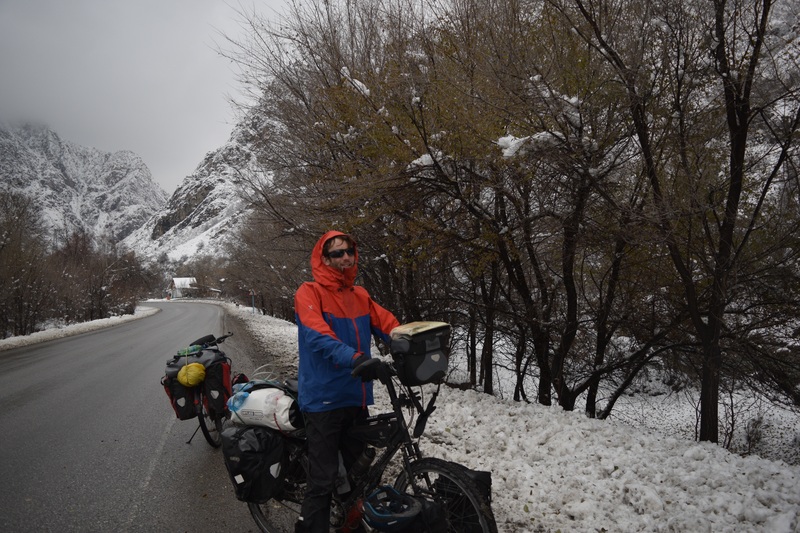 There was no way we were going to force ourselves to cycle at less that 5km/hr, falling off every five minutes and with the risk of being ploughed into by an out-of-control lorry, so we stayed with the brothers in their van until Bishkek, which was on the other side of the mountains. It was just too dangerous. And too cold. We had tried to beat the winter to Bishkek but it was laughing in our faces. Winter always wins! Anyway, the small part of us that felt disappointed at not having managed to cycle the whole way was quickly drowned out by the euphoria of a hot shower (it had been almost two weeks!) 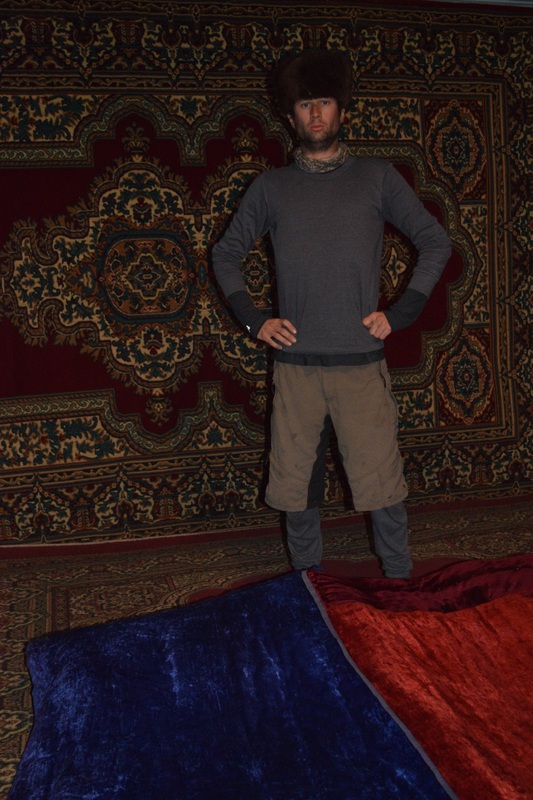 and a warm snugly hostel bed. The next morning we wandered around the city in amazement at the fact that you could actually buy things here, and eat food that wasn’t fat soup! We had been living so basically for so long and all of a sudden we had access to pretty much everything we needed. We had arrived at our winter bunker, and it was time to meet our new Russian family and start teaching English! Life was about to change dramatically for a while.